Well Summer is officially in full swing, and for our household that means it's finally time to put all my hours of preparation, and 'Pinning' to good use. You may recall I watch my niece after school throughout the district year; and have inherited 2 additional kiddos for the month of July. Mind you, I don't have my own kids I learned the joys of borrowing others' years ago, so wrangling a 3 year-old boy, and two 8-10 year old girls full time from 7AM to 4PM is a bit of a big bite off the cookie for me. Sabrina (10) and I are close enough to be sisters, and get into plenty of shenanigans when left alone, but finding activities to entertain both genders, let alone the age gap is a true challenge. It's a good thing I began preparing for Summer back in April, when I was only anticipating one child! Almost through week 2 of our adventure, I've found a comfortable schedule that usually consists of allowing the younglings to 'wake up' to an hour or so of Family Netflix programming. I'm not big on letting electronics entertain kids, so we then take a small late morning field trip then head home for, or pick up, lunch. By 1 the baby (3) is usually fighting to keep his eyes open, and goes down for a 45 -90 minute nap. This, my friends, is girl time. Glorious girl time. I picked up a bunch of clearance craft kits at Michaels for $4 or less, some $1 wooden picture frames to decorate for their Daddy's desk, some $1 paper masks (6 in a pack, and double sided), etc. It's amazing what you can do at a local Michaels craft store with a weekly coupon and some ingenuity and a few dollars. Once the little one is up, it's often time for an afternoon treat, and out to run around and burn off some energy before the parental units arrive. I love routine, and I feel the kids thrive on it, so this is how we operate. If there's one thing I know about kids it's that they love messes and colors. The girls love anything that involves the mixing of colors, or 'food rainbows' as they call it; and Sabrina (10) would live by my side in the kitchen if she could. So, when I came across an amazing post from Hungry Harps blog, during a Social Fabric Juicy Juice campaign, I knew I had to pin it to make this Summer. If I haven't mentioned it before, I simply adore Social Fabric, and being a part of their blogger community. For those unfamiliar, SoFab is a collection of talented bloggers, across many generes, working with sponsored prompts to create valuable consumer input for brands, and engaging content for consumers. I try to make every post amazing, but it's my SoFab posts that really excite me and bring out my best. 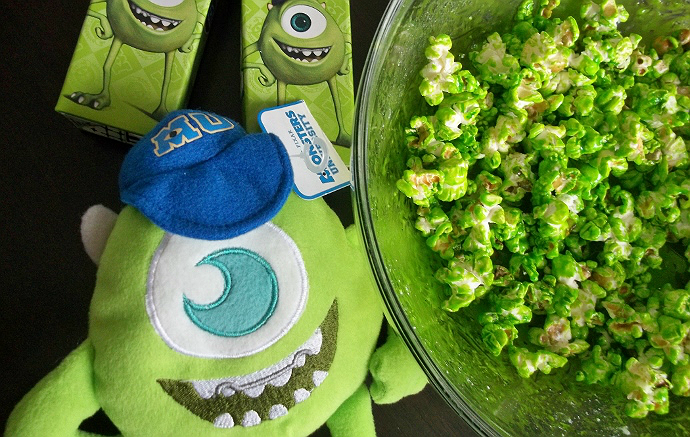 The Hungry Harps 'Monsters University Popcorn Mix' post is just a small example of pin-worthy, engaging, content created by the Awesomesauce bloggers at Social Fabric/ #cbias. If you're a reader you already know about all the buzz surrounding the newest Monster's Inc. Pixar installment, in our household. We were lucky enough to catch an advance screening, making Sabrina the coolest cat in her school heading into Summer, and sport a myriad of merchandise around the house. (Though I've yet to acquire my Archie the Scare Pig plush from the nearby Disney outlet.) I think it's safe to say, Monster's University has topped Despicable Me, though still on our must see list, for this Summer's hottest film. 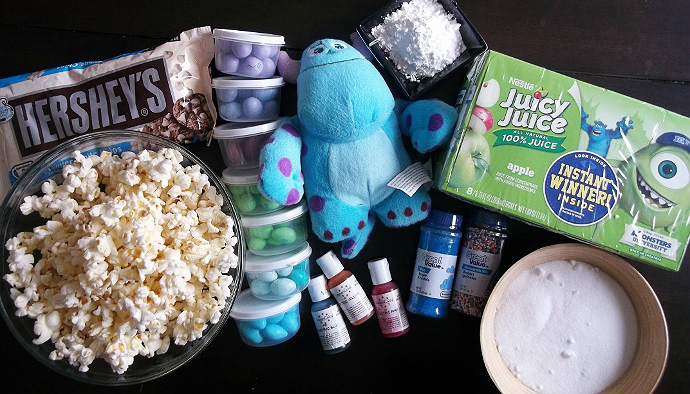 So, when I began this little project today, I simply told the kids we were going to make 'Monster popcorn,' and began lining the ingredients up on our table. I had them at popcorn, but you better believe I won them for certain with food color and sprinkles. When I was a kid Momma and I would make candied corn in the microwave. I recall, though she said it was the 'simplest' recipe she knew, it was a very arduous, and haphazard task. The Hungry Harps method is completely unique, and kid friendly. Children are sure to adore watching this multi-layered, multi-colored, snack some to life before their very eyes. Not only can it be used as a color education tool for the younger ones, but it would make a great party table feature at any Monster's University themed birthday parties this year! 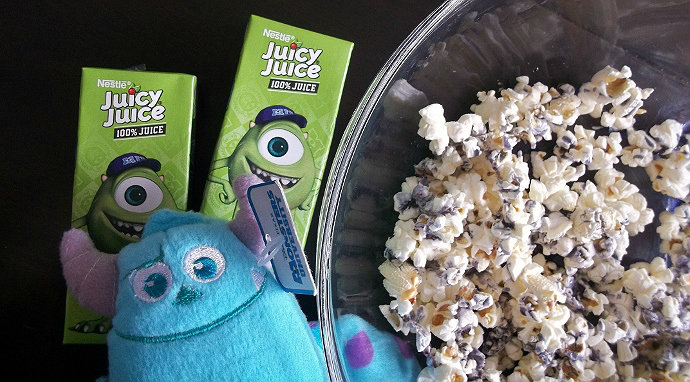 The original blogger had the intent of featuring Juicy Juice, branded with Pixar's Monster's University for promotional purposes this Summer; though all one really needs is some powdered, and regular, sugar, water, and food coloring. If you want to be extra cool, toss in a white chocolate drizzle with sprinkles, and some MandMs. Just watch your Mom status skyrocket as the kiddos dig in. I don't, generally, like to feed the kids 'junk,' but I also make sure they balance out these treats with lots of real fruit and veggie snacks, and plenty of water throughout the day. When you cut out the sugar in juices and sodas it's easier to negotiate spoiling like this recipe (and boy do I spoil, because that's my job as non-parental family!) Keep in mind this wonderful recipe can be altered in colors and 'candy extras' to suit a multitude of themes, so be sure to pin this for your big Halloween party, and try not to eat the entire bowl before sharing with the kids. And, one last time, because I believe in giving mad props, where props are due, the concept and recipe originated at Hungry Harps, where you'll find a myriad of tastebud tickling recipes and family posts. 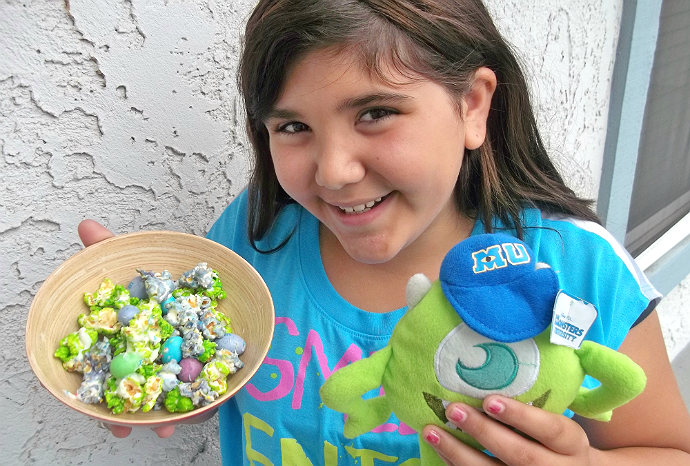 What Daughter Says: Bring a little fun to a dull Summer day with colored Monster's University inspired popcorn. 2.) 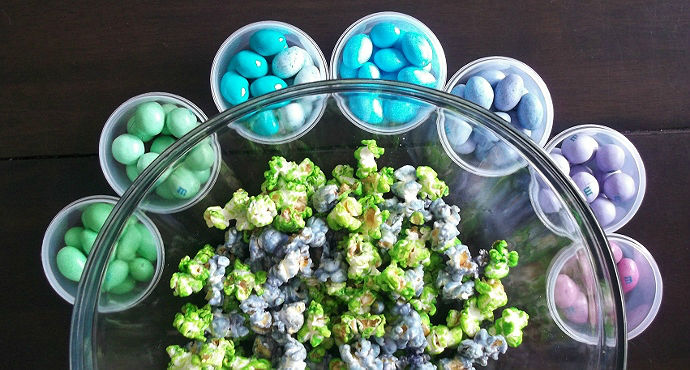 Portion popcorn evenly in medium-large bowls, according to how many colors you wish to make. Pour sauce over popcorn in a light splash/drizzle manner. Sprinkle with powdered sugar and toss with a large wooden spoon. Toss until popcorn is evenly coated and all liquid had been absorbed. 3.) 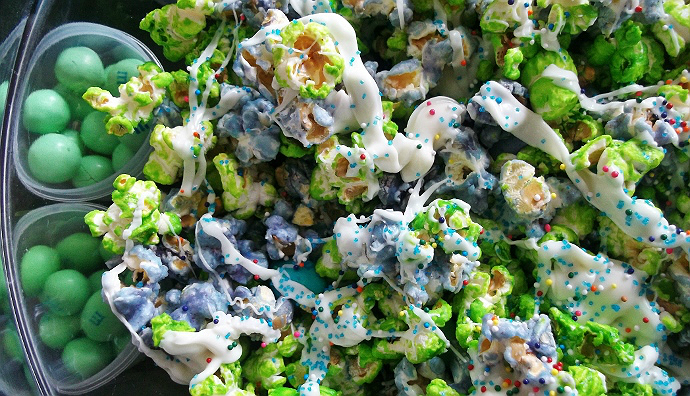 Evenly spread popcorn on a baking sheet covered in a sheet of wax paper or foil and allow to dry. 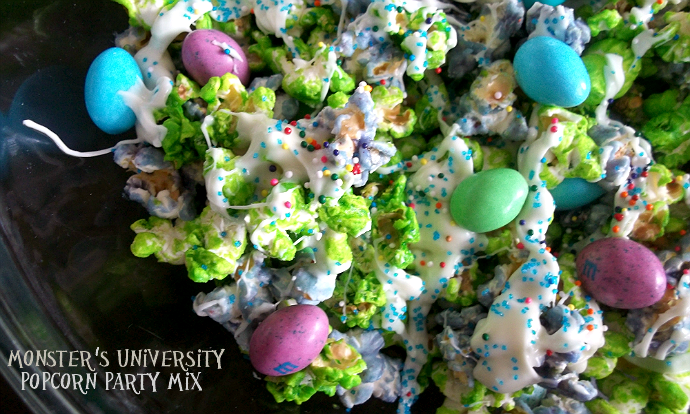 Layer with desired candy (MandM's), and drizzle with melted white chocolate and sprinkles for added 'Mosnters' color. Can I come over? That is so creative and fun. I just love it! Great party food recipe! The colors are amazing. Wow very colorful! Looks like it would make for a fun family movie night snack. I really, really love this idea. Every time I watch a movie with the kids I try to come up with some type of special snack. This fits so well with the movie. We have not seen MonsterU yet but it is on the list to watch! Thanks for yet another great recipe. That is super cute! How colorful!!!! My kids would LOVE that. We are having a birthday party soon. I think I will have to make this one. Thanks for the great idea! Jenna, I truly believe you missed your calling. You should be a food preparer for magazines and Tv. You presentation of this recipe (and the recipe) is fabulous. I found myself, as I was reading, saying to myself, "Oh, Please Please let her include the recipe!" Thanks for sharing at Foodie Friends Friday. We welcome links back to our party!